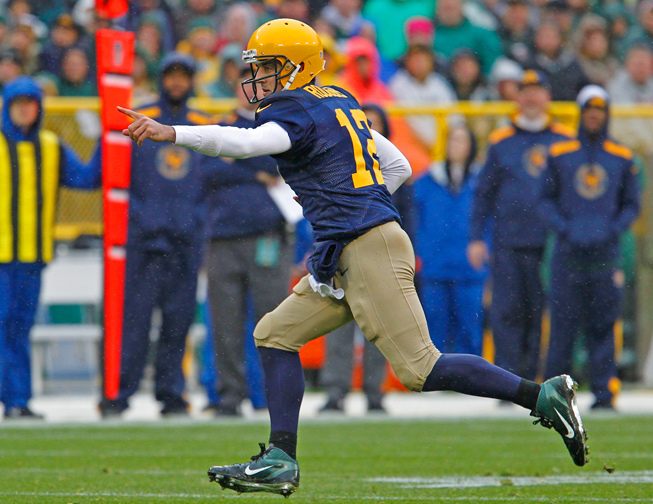 Despite injuries to key players, the Green Bay Packers seem to be able to fill in the voids and keep winning games. This past weekend for instance, the Packers had players that hadn’t shown much promise in previous games step up to become play makers. The first that comes to mind is Jarrett Boykin. Hopefully others will keep improving and help the Packers keep winning games despite the injuries. From a photographers stand point, shooting during rainy games is a pain in the you-know-what. Its a balancing act of trying to keep your gear dry yet accessible enough for you to use efficiently. Despite fumbling around with rain covered gear at times, I was able to come up with some shots I am proud of. Here they are. Thanks again for stopping by and looking. 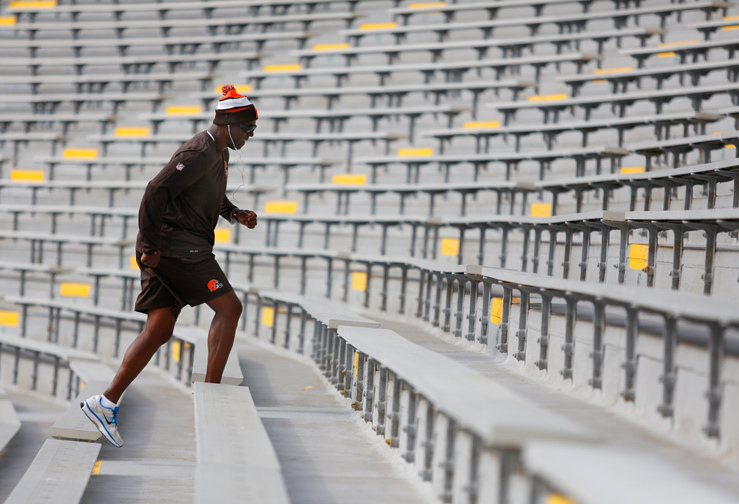 A member of the Cleveland Browns coaching staff runs the stairs inside Lambeau Field prior to the game. 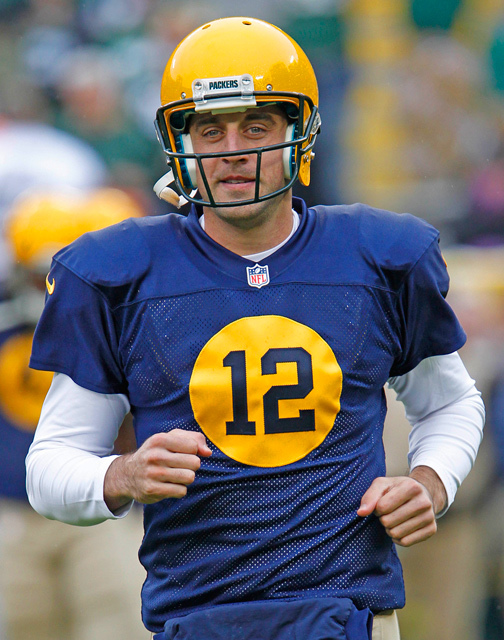 Green Bay Packers quarterback Aaron Rodgers. 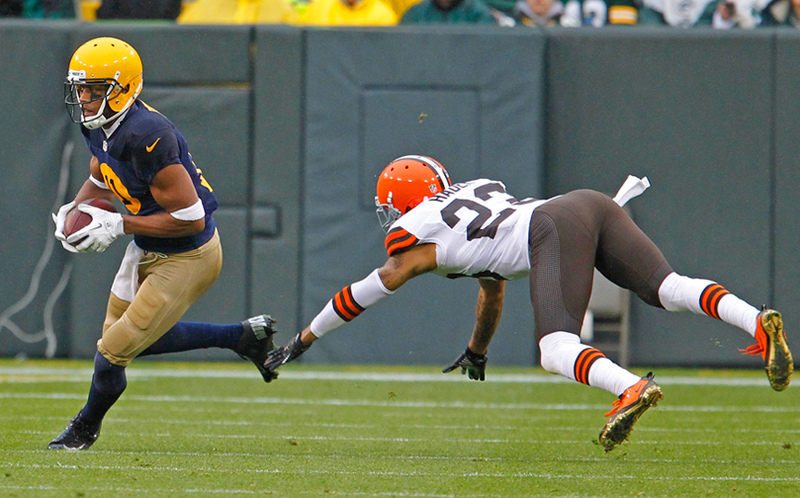 Green Bay Packers wide receiver Jarrett Boykin can’t pull in a pass while being covered by Cleveland Browns cornerback Buster Skrine. 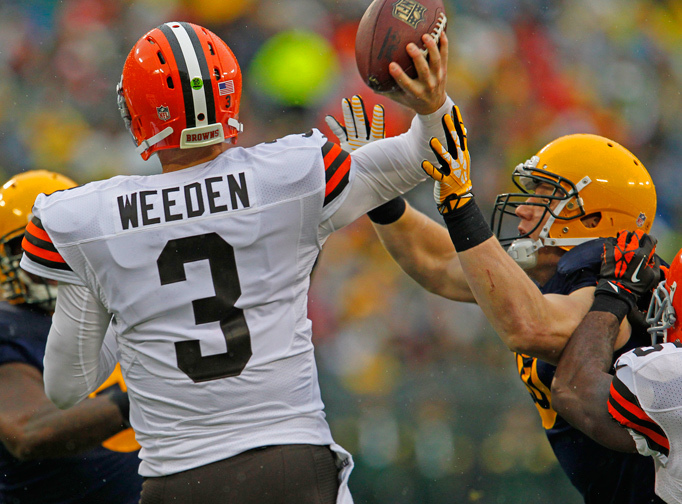 Cleveland Browns quarterback Brandon Weeden gets a pass off right before being hit by Green Bay Packers inside linebacker A.J. Hawk. 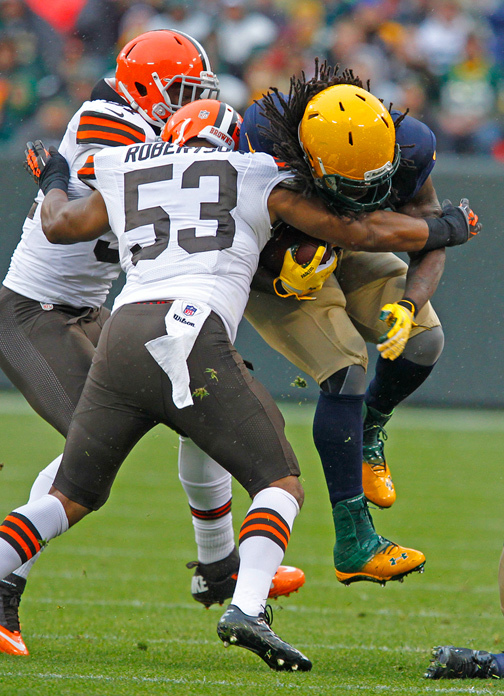 Green Bay Packers running back Eddie Lacy is hit during a run by Cleveland Browns inside linebacker Craig Robertson. 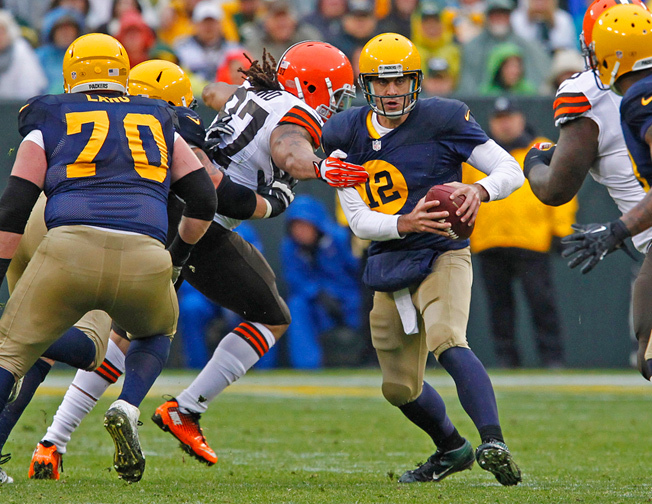 Green Bay Packers quarterback Aaron Rodgers scrambles with the ball against the Cleveland Browns. 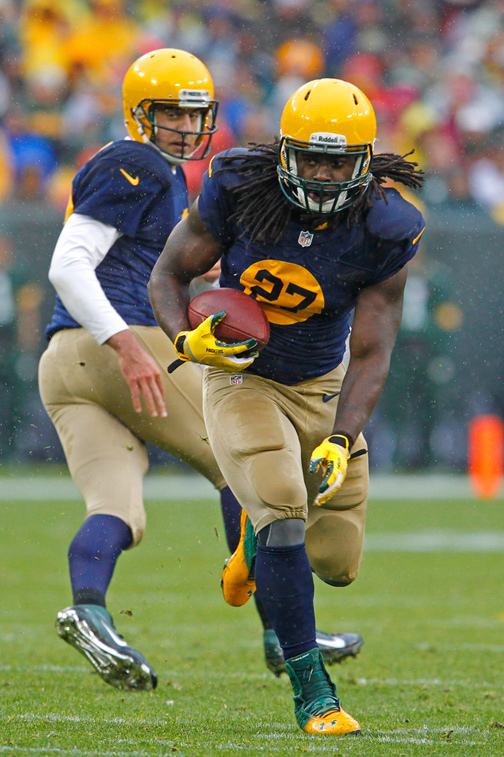 Green Bay Packers running back Eddie Lacy rushes against the Cleveland Browns. 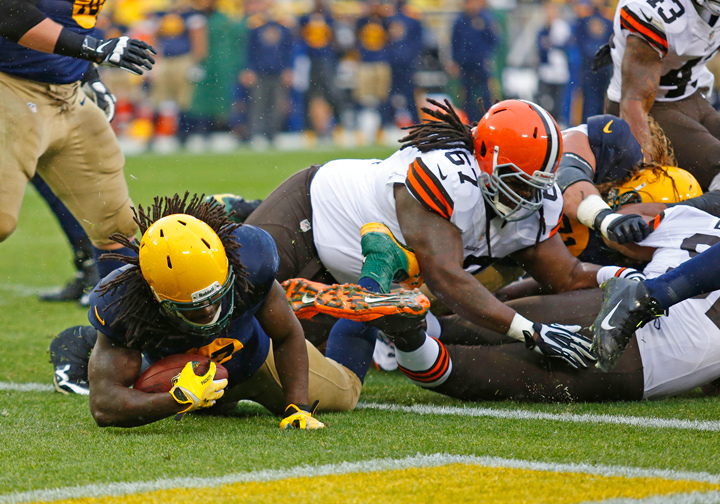 Green Bay Packers running back Eddie Lacy scores a touchdown against the Cleveland Browns. 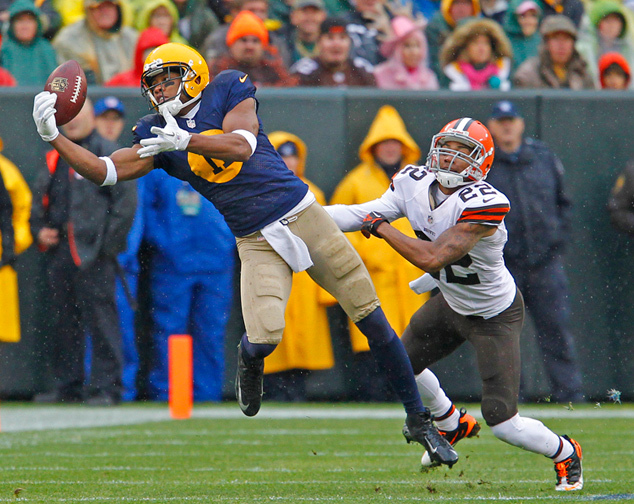 Green Bay Packers wide receiver Jarrett Boykin makes a catch while being covered by Cleveland Browns cornerback Joe Haden. 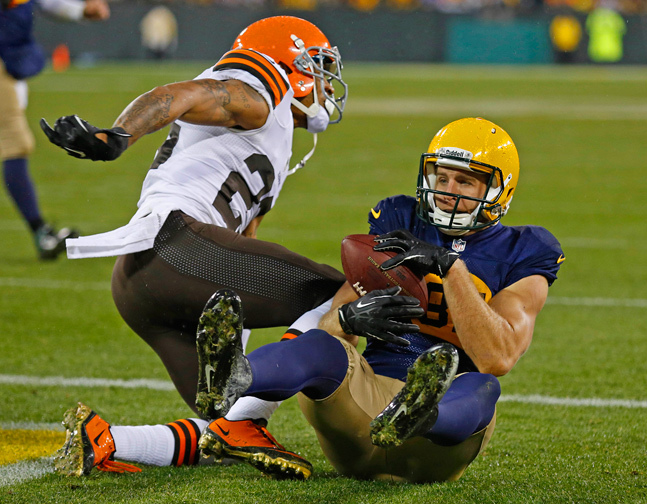 Green Bay Packers quarterback Aaron Rodgers breaks the tackle of Cleveland Browns outside linebacker Jabaal Sheard. 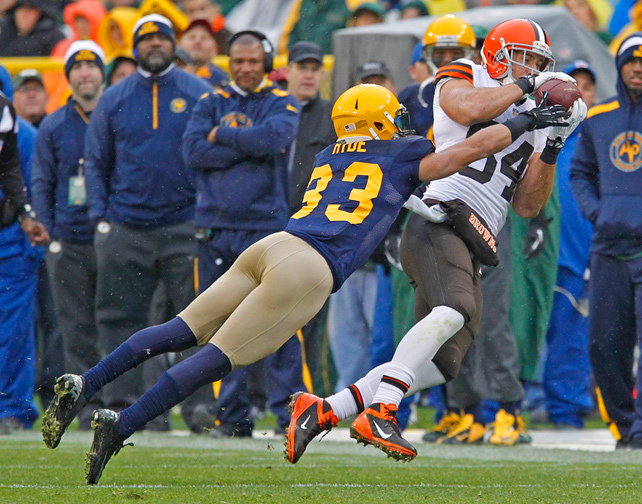 Cleveland Browns tight end Jordan Cameron makes a catch while being covered by Green Bay Packers cornerback Micah Hyde. 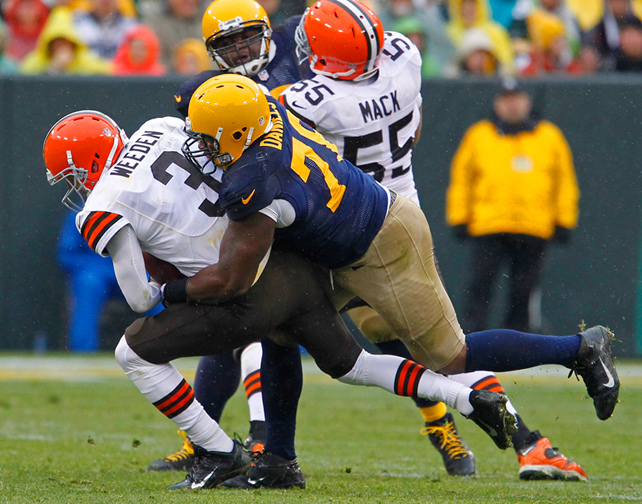 Green Bay Packers defensive end Mike Daniels sacks Cleveland Browns quarterback Brandon Weeden. 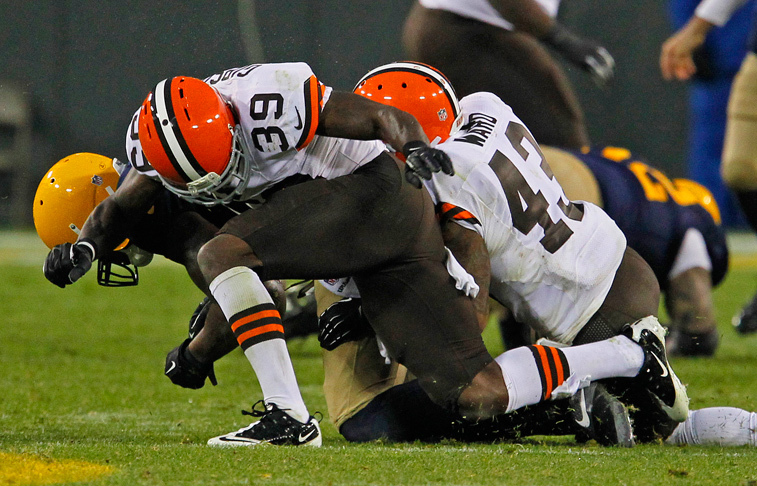 Green Bay Packers defensive end Mike Daniels hits Cleveland Browns quarterback Brandon Weeden. Green Bay Packers tight end Jermichael Finley is injured after being hit by Cleveland Browns free safety Tashaun Gipson. 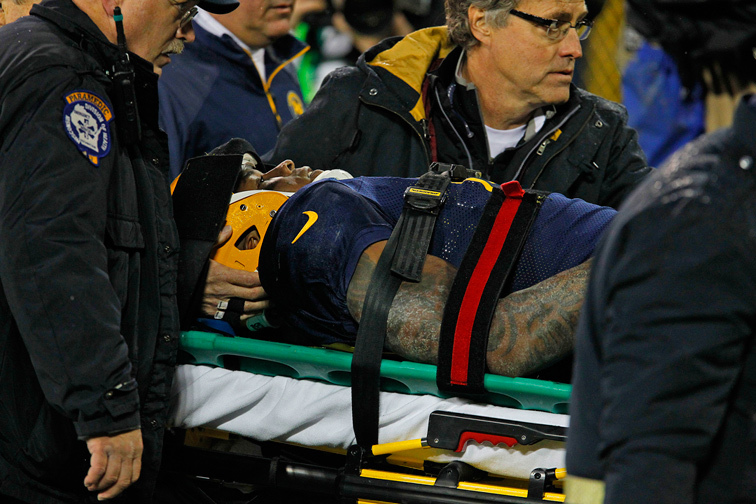 Green Bay Packers tight end Jermichael Finley is taken off the field after being injured. 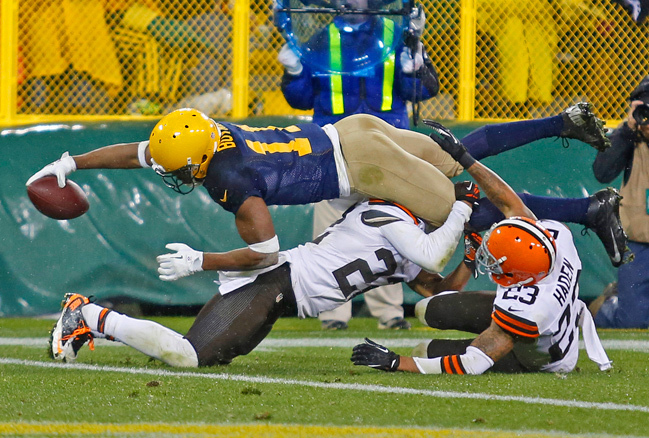 Green Bay Packers wide receiver Jarrett Boykin stretches to get the ball over the goal line while getting hit by Cleveland Browns cornerback Buster Skrine (22) and cornerback Joe Haden (23). Green Bay Packers wide receiver Jordy Nelson scores a touchdown while being covered by Cleveland Browns cornerback Joe Haden. Green Bay Packers guard Josh Sitton performs a Lambeau Leap after Green Bay Packers wide receiver Jordy Nelson scores a touchdown against the Cleveland Browns. 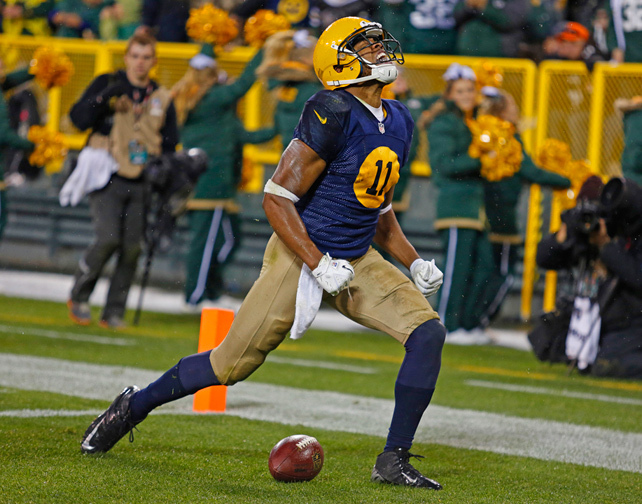 Green Bay Packers wide receiver Jarrett Boykin celebrates after catching a long pass against the Cleveland Browns. 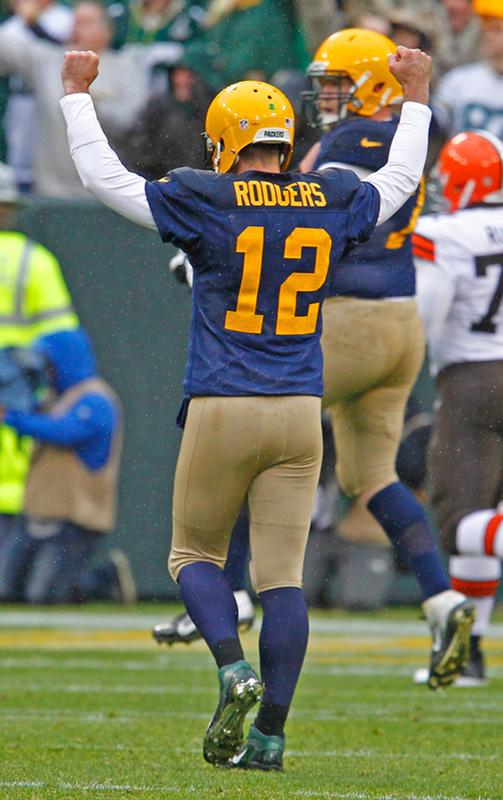 Green Bay Packers quarterback Aaron Rodgers raises his arms celebrating a Packers touchdown agains the Cleveland Browns. This entry was posted in Uncategorized and tagged A.J. Hawk, Aaron Rodgers, Brandon Weeden, Buster Skrine, canon 1d, canon 5d, Cleveland Browns, Craig Robertson, Eddie Lacy, football photography, Green Bay Packers, Jabaal Sheard, Jarrett Boykin, Jermichael Finley, Joe Hayden, Jordan Cameron, Jordy Nelson, Josh Sitton, Lambeau Field, Micah Hyde, Mike Daniels, NFL Photos, Sports Photography, Tashaun Gipson on October 23, 2013 by ludtkephoto.